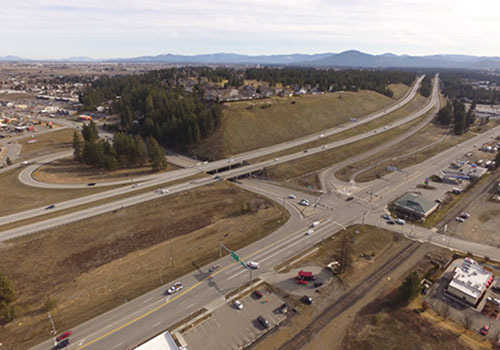 Following a public meeting in November 2018, the Idaho Transportation Department developed a different alternative for the Interstate 90 and Idaho Highway 41 interchange in Post Falls. The new design merges the advantages of the two alternatives that were developed by a special planning team and presented to the public last fall. Called an offset single-point urban interchange (SPUI), it features a SPUI shifted north of the interstate, eliminating the extensive impacts to Seltice Way and other local roads that were considered in the previous alternatives. The highway will still move to the west to better accommodate the ramps, and after passing under the interstate, connects to Seltice Way at Herborn Place. The offset SPUI eliminates the loop ramp at the westbound exit on I-90, a design element that was well-received in the original SPUI design. Construction costs are estimated to be $39 million, compared to the estimated $65 million for the earlier SPUI design and the $31 million for the half-diamond design. Members of the public will get a chance to formally comment on the selected design later this year. The project is scheduled to be constructed in 2023. To view other details about the proposed improvements, visit the project website.